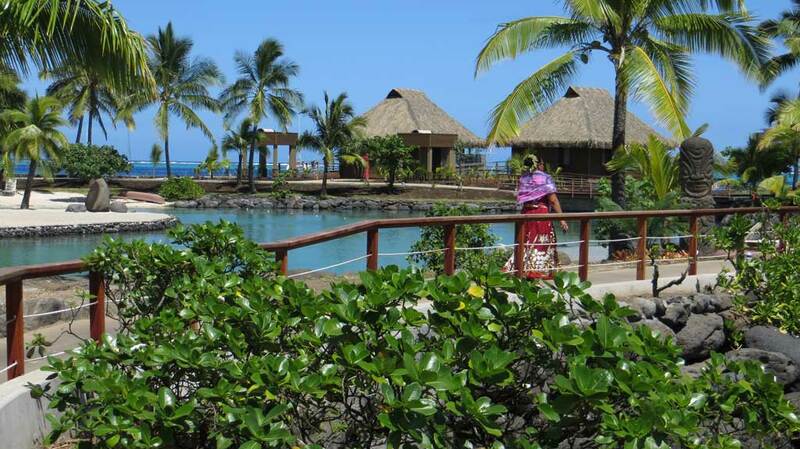 We loved our visit to the InterContinental Tahiti Resort & Spa. Its reputation as the best hotel on the island of Tahiti is warranted. What makes it great is the setting and the way they building capitalizes on the view. The restaurant is open air in a arch. It overlooks the infinity pool, the man-made lagoon and the waterfront bungalows. 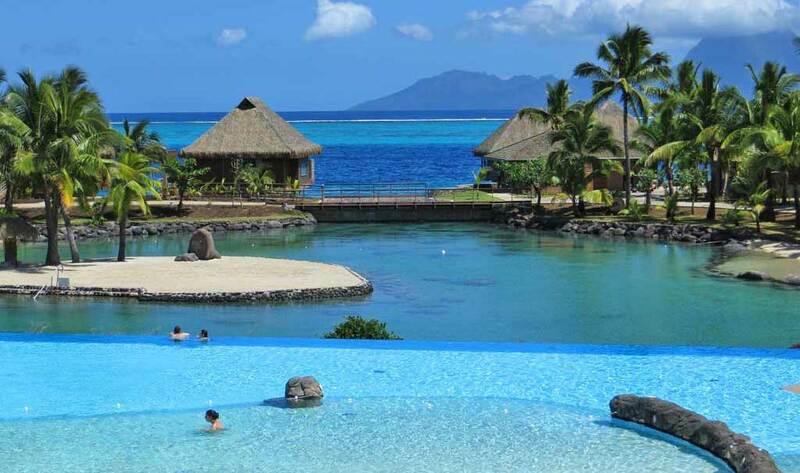 The impressive backdrop of the island of Moorea frames the setting. Two floors above the restaurant is the reception area with a bar and extensive seating. The view here is even more impressive than at the restaurant. The pool and lagoon are open 24 hours for swimming, which is a refreshing change from places like Mexico. 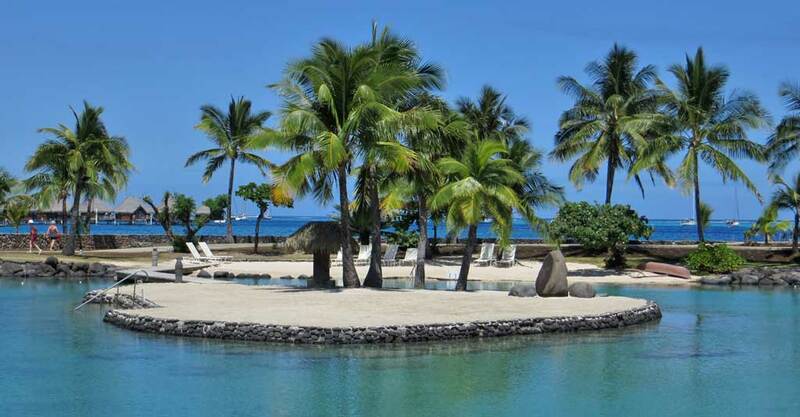 Numerous tropical fish live in the man-made lagoon and you can snorkel any time you want. Masks and snorkels are readily available. I’ve never seen such a great variety of fish that are so easy to access. The lagoon isn’t small and it receives its seawater directly from the ocean. Most of the fish like to congregate near and under the walkway to the lagoon’s island. We saw picasso triggers, numerous butterfly fish, beautiful parrot fish, needle fish, chromis, many varieties of tangs and much more. This is the best snorkel experience you will ever find in a five minute snorkel. If you just want to enjoy the view toward Moorea, the overwater bungalows are amazing. For snorkelers, the overwater bungalow experience at the InterContinental Tahiti isn’t quite as good as it is in other islands, like Bora Bora or Moorea. The bungalows aren’t sheltered by the shallow waters behind a reef, so it’s not as rewarding to snorkel off the deck. For snorkeling, head to the man-made lagoon instead. Enjoy the pool, the lagoon, the restaurant and the views at the InterContinental Tahiti. It’s a stop you shouldn’t miss in Tahiti.